It doesn’t do to gush when writing a hotel review, as it makes you sound far too easily pleased. Unfortunately – and despite our very best efforts! 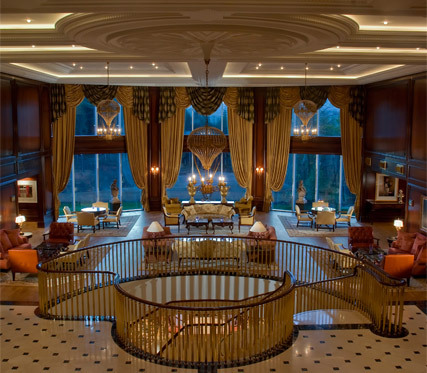 – we can’t think of a single bad thing to say about the Ritz-Carlton Powerscourt. Serene, stylish and with a spa to die for, it is, quite simply, one of the best hotels mc.co.uk has ever been lucky enough to stay in. From the moment the smiling doormen greeted us at the entrance to whisk away our bags, we felt right at home. The famous Ritz-Carlton it might be, but there’s certainly no stuffy atmosphere here. The friendly staff simply could not do enough to help, and we certainly got the feeling they would move heaven and earth to fulfil even the most challenging of requests. Drawing up to the swish residence, it’s hard not to be impressed by the hotel’s neo-classic Palladian façade – lovingly designed when the hotel was built in 2007. Step inside and it’s even more impressive – a sea of chic nooks and crannies (they’re just made for snuggling up in!) elegant airy spaces and arching crescent windows looking over manicured grounds. Formal, yes, but it’s cosy, too. Rooms are beautifully appointed and bedecked in light neutrals with everything you’d expect for your full five stars – plus more. The look is period charm meets glossy, sleek and stylish, and from the immaculately made beds to the fluffy white dressing gowns, the attention to detail is faultless. For gadget lovers rooms are equipped with clever electronic panels that do everything from dim the lights to close the curtains, and for girlie girls, the huge marble bathrooms and rainforest showers are a must. The best bit? It has to be the view. Our sprawling Mountain View Suite overlooked County Wicklow’s towering Sugar Loaf Mountain, as well as the garden’s lush greenery. We had certainly never realised the Irish countryside was quite so beautiful. As far as activities go, you name it, it’s here. Whether it’s golf, cycling, walking, horse riding, fishing or even archery you’re after, you’ll find something here. 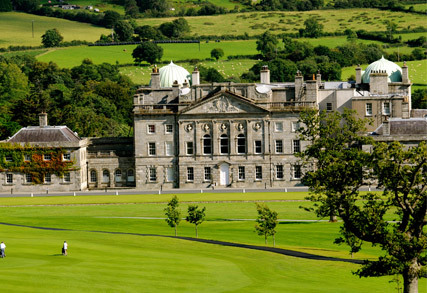 Being pushed for time, we swapped the heartier outdoor pursuits for a spin around the Powerscourt Estate’s grounds in one of the hotel’s handy golf buggies. Brilliant! But our absolute favourite feature of this feature-packed hotel? The state-of-the art, 30,000 square foot spa, complete with treatment rooms to die for and a Swarovski crystal-lit pool. If it’s relaxation you’re after, an ESPA massage or relaxing facial ought to do the trick, or alternatively you could soak up the stunning views – from the comfort of the thermal spa suite. If you can rouse yourself from your slumber after an afternoon of R&R – and trust us, it’ll be hard! 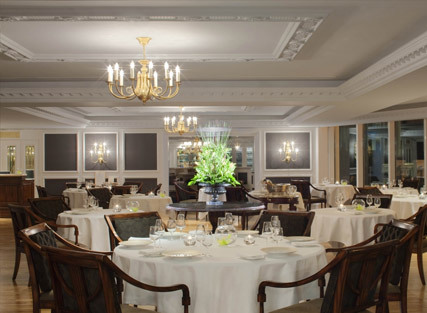 – the hotel’s Gordon Ramsay restaurant is well worth a visit. With a simple seasonal menu – all made using local, Irish produce – we were hard pushed to choose just three courses. Desserts are especially delicious (rum and raisin profiteroles with warm caramel sauce, anyone?!) so if you do visit, be sure to leave room. All in all? We wished we never had to leave. 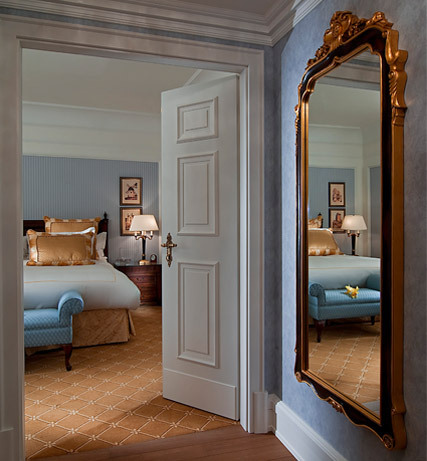 Details: The Ritz-Carlton Powerscourt, Powerscourt Estate, Enniskerry, County Wicklow, Ireland (353 1 274 8888; www.ritzcarlton.com/en/Properties/Powerscourt). 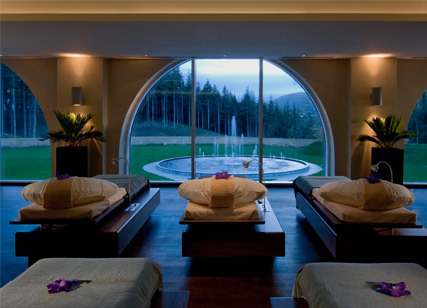 Rooms start from around £190 per night, with Spa packages at the ESPA spa start from £85.